This year, The BrandLaureate added an artistic twist to the prestigous The BrandLaureate Awards 2009 - 2010. 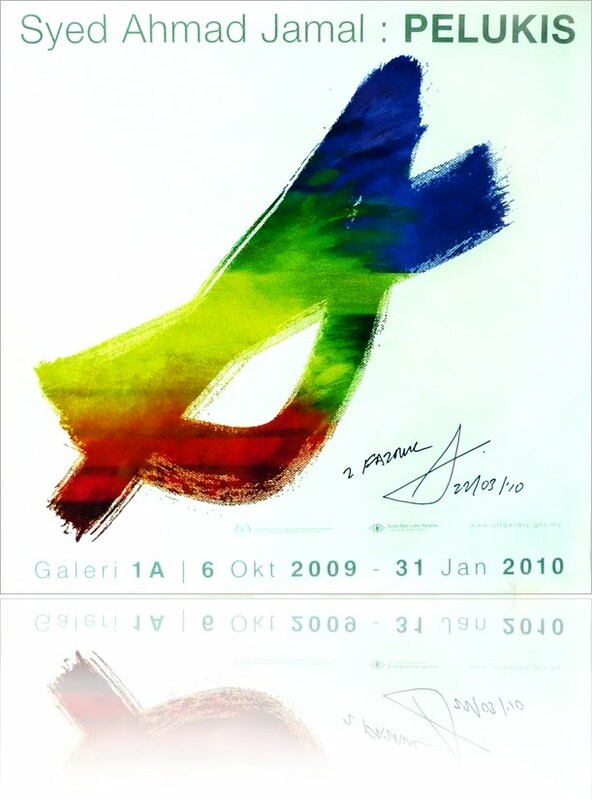 YBhg Datuk Syed Ahmad Jamal, the National Art Laureate was invited to paint a custom piece themed the 'Colors of Branding', his enterpretation of the kaleidoscope that is branding. Warna Tenaga' captures the energy of brands and the process of branding. This collaboration with Datuk Syed Ahmad is part of the CSR program of the Asia Pasific Brands Foundation. Proceeds from the sale 'Warna Tenaga' will be donated to charitable organizations. This collaboration marks the start of the Asia Pasific Brands Foundation's objective of promoting,educating and instlling the love of art amongst Malaysians and to showcase the work of great Malaysian artists. And below are the pics i took on the first night of 22nd march 2010 on his exclusive event at our National Art Gallery. It's a honor to be on a great events like this. And it was a first time i had a chance to talk to him in person. Datuk truly amazed me. A very simple and basic knowledge to draw a portrait, based on my own experiences. I would like to share it and hopefully this will help mostly for beginners. When you draw a portrait,better try not to concentrate too much on a likeness. Just concentrate on the structure and form of the face and a likeness will come itself. Unless your drawing a full portrait it is best to leave the background simple or even with no background at all. I believe the simplicity is the key to successful portraiture. Wait a few days before declaring a drawing DONE!. Often it takes several days for you to become less attached to the drawing. You will then be able to notice some additional flaws and errors in the drawing. Don't feel bad about it. This is very common. It's only part of the process. Look at the drawing upside-down. This will help you see if anything is crooked, or lopsided . If you are having trouble drawing a particular part of a portrait, turn the photo upside down too, and draw everything in that position. This will assists you in drawing accurately. While working on a drawing, frequently look at your drawing in the mirror. Or, put your drawing up to a bright light and try to look at it in reverse. This will allow you to see weird lopsided flaws in your drawing, that you wouldn't notice otherwise. It is a great way to check any problem areas in your drawing before you work any further. A perfect words to describe about his solo art exhibition at lobby one NSTP ( Balai Berita The New Straits Times Press ) from 1 - 31 Mac 2010. Ahmed Fauzi is an old friend of mine when we used to work together in Dewan Bahasa Dan Pustaka. I never meet him for quite long since i resigned from DBP. Not untill last thursday when my friend Suzana mentioned that Fauzi came out on television lived talk about his art solo, made me feel like can't wait to drive to the gallery to meet him. Ahmad Fauzi is a great artist. I love how he utilizes watercolor to bring out a refreshing interpretation in all of his mangrove series...spectacular! Look like Fauzi has opened the heavens and showcased all his paintings for sale. Better don't just take my words, get more details in his blog. A short,simple and really supportive promotion to my blog from Paul Hm in his blog Hacking The Hacked. I'm feeling grateful of the writing and the blog exposured in his beautiful site. Thank you Paul.